This home was a Thrivent Builds project with partner family Angela Curry. The excavation was completed by Bill Gruska, and the Curry Construction crew set the forms. All was ready on Tuesday, June 16th for our big Build with the Bishop Day! We were also overjoyed to host volunteer crews from Wells Fargo, the Care-a-vanners, and volunteers from Hope Community Presbyterian Church, Resurrection Catholic Church, local LCMS congregations at the Build with the President, Our Savior's Lutheran Church in Hibbing, and Faith United Lutheran Church in Iron. Check out our blog for photos of these exciting volunteer days. 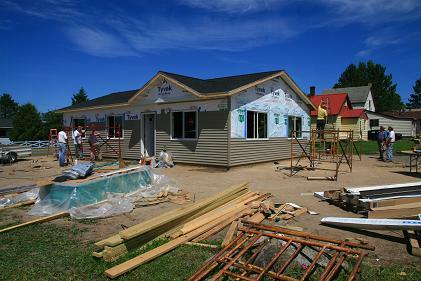 Local volunteers have worked hard this July to finish the insulation and sheetrock. Local LCMS pastors and congregations joined President Fondow for a Build with the President day to finish the exterior and sheetrocking.